Rohwer Elementary in Omaha Nebraska brought me back into their school for a second time. This was great, because the early levels who didn't have the chance to hear about the first world tour got to take that trip with me. The students in the higher level grades were able to travel with me on my latest adventure. Today was a special day. The Fremont Middle School sixth grade teams took a trip with me through Central and South America. A big thank you to Mrs. Wachter for organizing my day with the students. A magical visit at Highland Elementary school. Nothing short of pure magic, this is how I choose to describe my three-day visit at Highland Elementary in Centennial Colorado. Over the past year I have been working with Mrs. Amy Lumley-Tharp. By the time I had arrived at the school, each classroom had written me letters on my blog. She organized writing sessions centered around using the information on the blog and coordinated with me to insure all the student’s letters received a response. I had a wonderful day with the students at East Elementary in Littleton Colorado. The weather was so nice that we had lunch outside with a special group of students. Mrs. Kay Bolerjack prepares the students for one of the programs at East Elementary. Powell Middle School - Colorado! Students at Powell Middle School hang a sign in the library to welcome me to their school. What an honor it was for me when I was asked to return to my alma mater to give a lecture about my latest adventures. I had the privilege to address a packed lecture hall in Connell on the campus of Wayne State College. 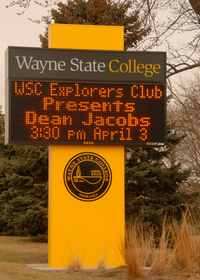 The Wayne State Explorers Club and the Wayne Herald sponsored the lecture. There is something special about looking into your audience and seeing your college professors listening to you lecture. It brings me great pleasure to know they care enough to share their time with me. I remember wise people telling me it is always a sign of character to remember from where you came. My return visits to Wayne State always provide me the opportunity to do just that. I was able to visit with people who touched my life in special ways while I attended Wayne State. Many I hadn’t seen for years showed up and gave me the opportunity to grab a few hugs. A special thank you to the Wayne Herald for helping sponsor the event. And to Dr. Randy Bertolas and the staff at Wayne State for the warm welcome they always extend to me. I spent a wonderful day with the students and staff in Burwell Nebraska. The students asked great questions. Burwelll is a beautiful place. It's the type of place where I could see myself living on a ranch!